Select activity and preferred date. Enter promo code at check-out page. Enter payment details to complete your booking! Valid from 18 February 2019 to 30 April 2019. Limited to first 100 checkouts only! The promo code is valid for bookings from 18 February 2019 to 30 April 2019. The promo code MYSAKURAFEVER entitles Klook users RM55 off with minimum purchase of RM900 in a single booking on the Klook website and mobile app excluding Universal Studios Japan Admission Tickets and Express Passes. 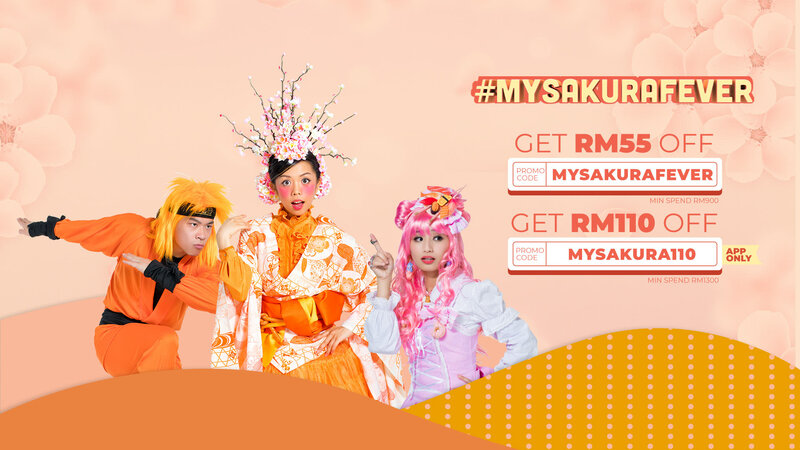 The promo code MYSAKURA110 entitles Klook users RM110 off with minimum purchase of RM1300 in a single booking on the Klook mobile app only excluding Universal Studios Japan Admission Tickets and Express Passes. Special deal codes are Buy 1 Free 1 deals on selected activities only, valid from 18 February 2019 to 30 April 2019. Special deal codes are limited to the first 100 checkouts only and will be on a first come, first served basis. Select 2 adult tickets & get one of them for FREE when you use the special deal code. Special deal codes are valid for Klook mobile app bookings only. Each promo code is valid for one-time use per customer and for Malaysian users only. Klook reserves the right to require payment of fees or charges for any Services offered by Klook. You shall pay all applicable fees or charges, as described on this Website in connection with such Services selected by you. Klook reserves the right to change its price list for fees or charges at any time, upon notice to you, which may be sent to you by email or posted on this Website. Your use (or continue to use) of the Services offered by Klook following such notification constitutes your acceptance of any new or revised fees or charges. Klook reserves the right to suspend, cancel or modify the promotion and Terms & Conditions at any time without prior notice. Klook does not accept responsibility in the event that you are unable to utilize the promo code. The promo code CIMB75 is only valid for booking payments made with CIMB Bank debit, credit or prepaid cards, valid from 11 March to 30 April 2019. The promo code entitles Klook users RM75 off with minimum purchase of RM900 in a single booking on the Klook website and mobile app excluding Universal Studios Japan Admission Tickets and Express Passes.